But it isn’t. Therein lies the core of Democrats’ concerns with 22 days to go, as they worry that a whole lot of their midterm enthusiasm will wind up wasted in places they don’t need the extra votes. The new ABC News/Washington Post poll reveals the potential electoral consequences of the very different slices of the nation that are voting in the midterms. Nationwide, Trump has a 41 percent approval rating, and Democrats have a 53-42 percent edge in the generic ballot for the House. But inside the 66 districts that are tossups, or only leaning toward one party or the other — the majority makers, or breakers — that lead evaporates into a 46-47 Democrats v. Republicans race. It’s a similar dynamic — driven by Democratic strength in cities, and weaknesses in rural areas — that is driving House and Senate forecasts in opposite directions, amid a campaign close set to be dominated by the president. Americans responding to the latest ABC News/Washington Post’s poll say they trust Democrats more than Republicans to handle six out of the top seven policy issues identified this election season. That’s pretty nuts, especially considering the list includes issues typically favorable to Republicans, such as taxes and changing Washington. The one issue where Republicans enjoy more trust is on the economy broadly, but only by four points. By a staggering margin of 18 points, people said they trust Democrats more than Republicans on the key issue of health care. What’s more, 82 percent said health care was highly important in their vote, a big advantage for Democrats. 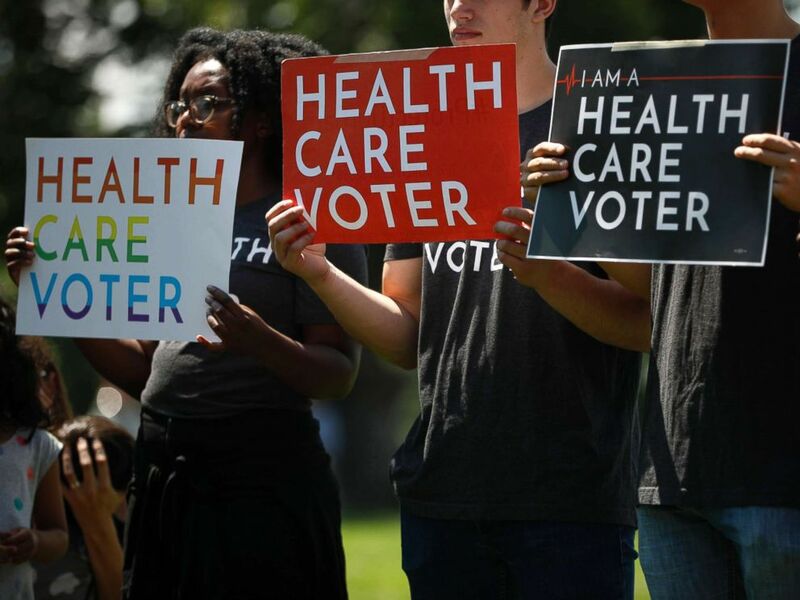 Demonstrators hold signs as Democratic leaders speak with reporters outside the U.S. Capitol on June 26, 2018 in Washington, D.C.
It’s easy to attribute Democrats’ double-digit advantage on the generic congressional ballot as the result of a highly motivated base of young (and mostly female) voters, fueled by a burgeoning progressive movement and a historic gender gap not seen since the early 1980’s, that the party knows they must turn out to win in November. “In my view, what this whole election will come down to is whether we can mobilize people to come out and vote,” Sen. Bernie Sanders, I-VT, told ABC News Chief Anchor George Stephanopoulos on “This Week” Sunday. But where Democrats who are hoping for a wave election akin to the 2006 midterms (where Democrats flipped 31-seats on their way to re-taking the U.S. House) should look for affirmation is at those all-important Independent voters who could decide their fate in 2018. In 2010, when the Tea Party insurgency delivered Republicans an historic 61-seat gain in the House, Independents favored the GOP by a wide 14-point margin in ABC News/Washington Post polling. Eight years later, Democrats hold that very same 14-point margin with Independent voters. In an era defined by political polarization and party tribalism, it could be that in the end, it’s those in the middle that deliver change to a divided Washington. 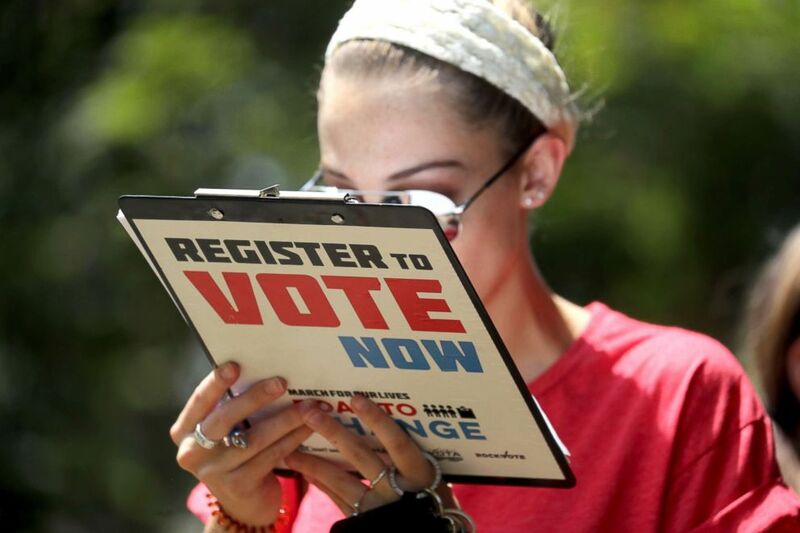 Chloe Weiland registers to vote during the Road to Change bus tour, July 28, 2018, in Tallahassee, Fla. The president and first lady head to Okaloosa County, Florida, on Monday, an area affected by Hurricane Michael. In Arizona Monday, U.S. Senate candidates Democrat Kyrsten Sinema and Republican Martha McSally face off in their first debate for the seat, which is currently held by Republican Sen. Jeff Flake. The state has never elected a female senator but is poised to do so this November. 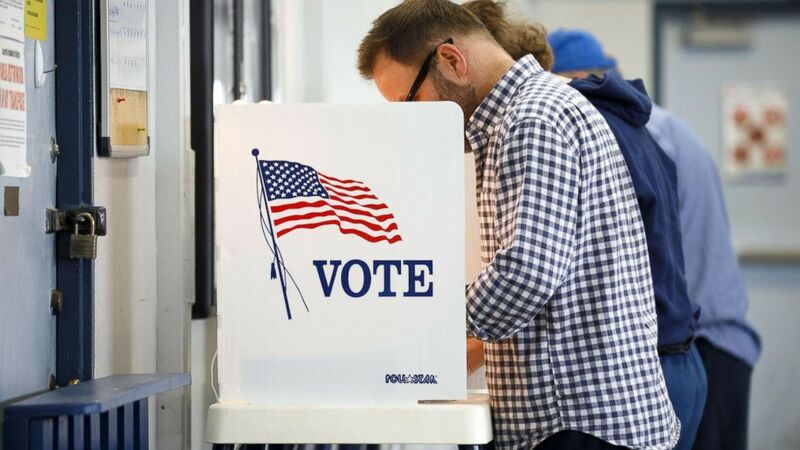 In Utah, candidates in one of the state’s most competitive races this election cycle debate Monday for the chance to represent Utah’s 4th Congressional District. Republican incumbent Rep. Mia Love, the only African-American Republican woman in Congress, faces Democratic challenger Salt Lake County Mayor Ben McAdams. Angela Merkel Averts Crisis and Gets Her Coalition With Help of S.P.D. Again.